Cheap Flights to Nadi, Fiji. Return Flights. 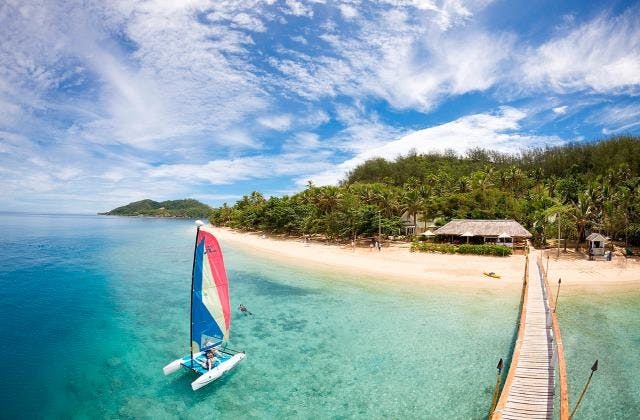 With warm tropical waters, spectacular coral reefs and soaring volcanic peaks, Fiji is one of the gems of the Pacific. From its sandy beaches to its lush rainforests, the country invites divers, sightseers and nature lovers from around the world. The largest and most heavily-populated islands in Fiji are Viti Levu and Vanua Levu; the capital, Suva, is on Viti Levu. Nadi International Airport on Viti Levu makes this island the most popular -- though not the only -- starting point for visitors. The colour and diversity of sea life in Fiji's coral reefs is unparalleled, and scuba diving in these environments is one the most popular activities for visitors to the islands. Whether you're an experienced diver or just starting out, you can find great diving anywhere in Fiji. Some of the most popular areas are in the "Coral Coast" region along the southern side of Viti Levu. Diving isn't the only way to explore nature in Fiji. Sea kayaking, whitewafter rafting, nature hikes and just lazing on a soft, white-sand beach are all options. If you want to get away from the denser crowds in popular tourist spots, take a cruise around some of the more remote islands such as the Mamanuca or Yasawa chains. Even a bus trip can show you spectacular scenery; the bus from Nausori to Tavua passes the astonishing view of Mount Tomanivi. A visit to a Fijian village is a great way to learn more about the local culture. A gift of kava (the local drink made from pepper root) for your hosts is traditional, and small gifts for children are always well-received. Kava ceremonies are rites in which participants share kava; they're often followed by celebrations with songs and dancing. Be sure to observe local customs outside of the tourist areas; modest clothing is expected. Removing your hat is a customary sign of respect. Fiji's weather is tropically warm throughout the year, with temperatures in the coolest season (from May to October) still averaging over 20 degrees. November to April can see heavy storms to go with their higher temperatures. The Coordinated Universal Time value for Nadi is 43200. Lamassa in Papua New Guinea is the nearest international airport to Nadi. It is approximately 246 kilometres . NAN is the International Air Transport Association (IATA) airport code for Nadi.